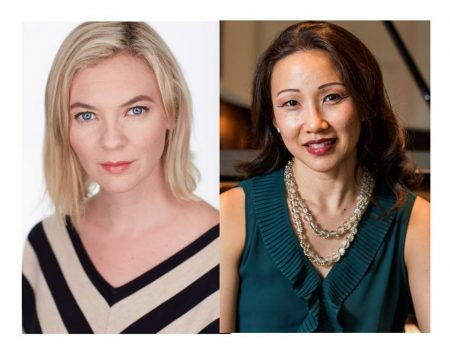 Though Corrine Byrne, a New York-based soprano, and Emily Yap Chua, pianist and Randolph music professor, are the featured performers at the next Guest Artist/Faculty Recital on Tuesday, November 13, the concert will also highlight a wide range of accomplished female composers. The event, which is free and open to the public, starts at 7:30 p.m. in Wimberly Recital Hall, inside Presser Hall. The recital, a program of classical and contemporary art song and musical theatre, includes works by Jason Robert Brown, Kurt Weill, Richard Strauss, Melissa Dunphy, Niloufar Nourbakhsh, and Leanna Kirchoff. The set written by Dunphy was inspired by Nikita Gill and her poetry on female empowerment, taking an intimate look into the process of healing after a traumatic experience. It ends with a trio entitled, “#MeToo,” which will feature Marianne Virnelson ’17 and Tara Bouknight, an adjunct instructor of voice at Randolph. In addition, Byrne will perform a scene from Nourbahksh’s chamber opera, We the Innumerable, which was written in response to the massive protest in Iran in 2009 and sheds light on the injustice of the election as well as the violence against protestors. Byrne will also perform works about women’s stories, such as selections from Kurt Weill’s Seven Deadly Sins and Strauss’s Ophelia Lieder. “When I heard about the Randolph music department’s diversity initiative, it didn’t take long for me to think of amazing composers writing work that speaks to issues that I believe cannot be ignored, and ones that are especially important to be vigilant about in these tumultuous times,” Byrne said. Recognized as a “celebrated singer” (Broadway World), Byrne has quickly become a sought-after interpreter of repertoire from the Medieval to the Baroque era, and music by today’s most daring contemporary artists. Some of her recent roles have included Filia in Jephte, Anna in Die Todsünden, Gretel in Hansel and Gretel, and covering the title role in the North American premiere of Handel’s Almira with Boston Early Music Festival. Byrne was also one of 40 soloists in a rare performance of Lucerne Festival Academy Orchestra in Lucerne, Switzerland. Byrne co-founded two ensembles: Ensemble Musica Humana, which tells stories through imaginative, historically-informed programs, and Tempus Continuum Ensemble, dedicated to commissioning new composers for daring modern works that explore new ideas and techniques. As part of the Byrne:Kozar:Duo, she also commissions new works for soprano and trumpet with trumpeter Andy Kozar. She regularly collaborates with early music collective Polyphemus, and appear regularly as a soloist with Westchester Oratorio Society. Her repertoire covers opera, jazz, pop, early music, and contemporary classical music. In addition to the performance, Byrne will lead a master class and colloquium talk for Randolph students and perform again in the Fall Chamber Orchestra Concert later that week. In the master class, Byrne hopes to share with students some technical knowledge of the mechanics of their instrument, as well as talk about relevant topics of style and language according to their repertoire. “Bringing a new perspective to young students in the midst of their musical careers is something that is very important to me,” Byrne said. “I find the work very fulfilling, especially bringing out the best in a student and helping them to both see areas of improvement while renewing their appreciation for their own potential, and their own artistry.